Males are up to 11 mm long, females can reach up to 20 millimetres (0.79 in). 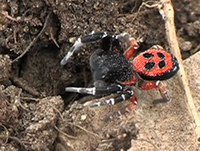 Males have a black prosoma and a strikingly red opisthosoma with four black dots (sometimes with white lining), resembling a Ladybird. The black legs have white stripes, the hind legs are partly red. Females are black with some white hairs, only the front is sometimes yellow. It prefers sunny, dry locations and is widely distributed in Central and Southern Europe. In England, it can be found only in a "secret" half-acre patch of south-facing Dorset heathland. These spiders live in up to 10 centimetres (3.9 in) long underground tubes with a diameter of about one centimetre. On top they are much wider and lined with cribellate silk. Many webs can usually be found in the same place, sometimes up to ten on a single square metre. E. cinnaberinus mainly catches millipedes and beetles. Males walk around during September, searching for females. If it finds one, it lives with the female in her tube, and they feed from the same web. This spider is classified as endangered in Great Britain. It is given full protection under Schedule 5 of the Wildlife and Countryside Act 1981. In Germany it is also considered endangered. The False black widow (Steatoda paykulliana). Large species (female13mm, male 6mm) of the family Theridiidae, dark brown or black color, with the anterior surface of the opisthosoma Traversale a red band, sometimes orange or white, sometimes accompanied by a dorsal design with angular extensions of the same color. Male is 6mm long, the female 13mm.The web, inconspicuous, extends into the holes in the ground, under stones. The bite of adult females can cause problems. Toxicological study highlights the similarity of venom of this species with that of the Black Widow. It is widespread in the Mediterranean region.